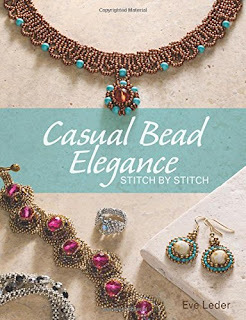 Eve Leder has written a new book, Casual Bead Elegance, published by Kalmbach, which doesn't make you choose which stitch to learn...instead, Eve wants you to try them all! And then she wants you to learn how to combine them! 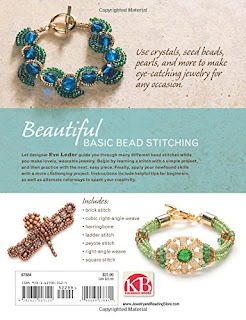 Using beads that any beader will most likely have on hand (seed beads, crystals, pearls, a few gemstones, and a couple of shaped beads), Eve leads you through ladder stitch, right-angle weave, cubic RAW, herringbone, square stitch, circular brick stitch, peyote, and then finally combined stitches. You'll find three main projects for each stitch, plus variations. The first project teaches the stitch path and reinforces good habits from the start. The second project allows you to practice the new stitch with a more elaborate result, and the third challenges you to apply the new stitch in even more challenging ways. 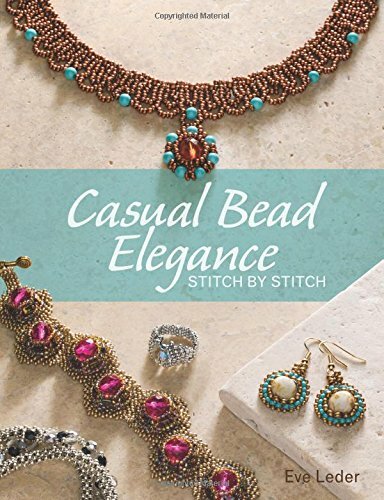 If you've been wanting to brush up on off-loom beading stitches, work your way from the ones you already know into others, or just expand your skill in a few of them, this may be the book to get you going and moving beyond your present comfort zone!